This petition has been created by Peter B. and may not represent the views of the Avaaz community. Bernardo Aban Tercero, a Nicaraguan national, was charged and convicted of capital murder in Texas in 2000. The death for which he was held responsible, is disputed in terms of the degree of culpability, but here we are concerned with matters pertaining to his age at the date of the crime. 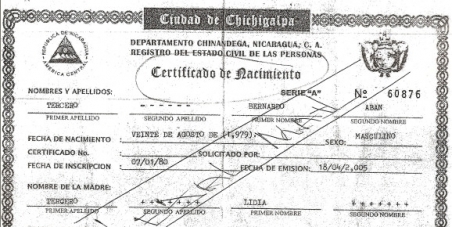 Bernardo has produced strong evidence that he was under the age of 18 at this time. This evidence involves a birth certificate whose validity has never been tested by oral cross-examination in a court of law in the US. Rather, the State and the Federal District Court rely on a subjective critique of the circumstances surrounding both the age claim and the birth certificate to disparage them, using such terms as "bizarre" and "incredible". The US Constitution, by the decision of the US Supreme Court, bans the execution of persons under 18 at the commission of murder. This is of such fundamental constitutional principle that evidence MUST be tested in a courtroom.